If you are looking to buy a home for sale @ Country Crossing in Stansbury Park you need to read this post that Chris or Berna wrote last week about that neighborhood. But that's not enough. There is more. So i thought i would add to that. It has to do with location and price. That really means (among other things), drive time to work, and how does the price compare one neighborhood against the other. Stansbury Park Location : If you work anywhere on the west side of Salt Lake, from the industrial area around the airport, or at the airport itself you are probably closer to your job when you live in Stansbury Park than you are from any of the communities in the South end of the Salt Lake Valley. If not in distance, try measuring drive time, and weigh freeway driving versus the stop and go motoring you would experience driving from the airport to Rosecrest in Herriman UT. With the price of gas being what it is, and likely to remain, that is not an unimportant factor in the decision to buy a home or Condominium. Prices of Homes For Sale in Stansbury Park UT: The price advantage of buying in Stansbury Park are obvious. But don't believe me. Check it out yourself. Just compare new homes listed prices by square foot with comparable standard features, in different areas in the valley and you will quickly see that dollar for dollar, you get more value in Tooele County. Looking for a home for sale in Stansbury Park UT @ Country Crossing? 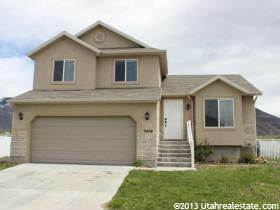 Take a look at this one in one of Tooele Counties nicest neighborhoods; Country Crossing. This Stansbury Park house is just 30 minutes from downtown Salt Lake City, and a much shorter commute to the Airport for those that work in that industry, fly a lot or work in the industrial companies nearby. Other Stansbury Park homes For Sale you might be interested in are short sales in Stansbury Park, and Stansbury Park Condos for sale. You can't beat the price per square foot in this area. With the Stansbury Golf Course, your own fishing lake, the observatory, and proximity to Miller Sports Park this home is well worth seeing. Home For Sale Stansbury Park UT @ Country Crossing, Tooele County - 100% financing available. Great home in Stansbury Park, only 30 minute commute, yard was just seeded. Fantastic neighborhood. Great mountain views. Walking distance to elementary school. Formal living room and family room. Room to grow in basement. For more information about this home for sale in Stansbury Park UT @ Country Crossing call Berna @ 435-840-5029.